While there have been many proposals for preventing asteroid collisions with Earth, ranging from nuclear detonations to gravity tractors, paintballs have never been in the picture. Until now. 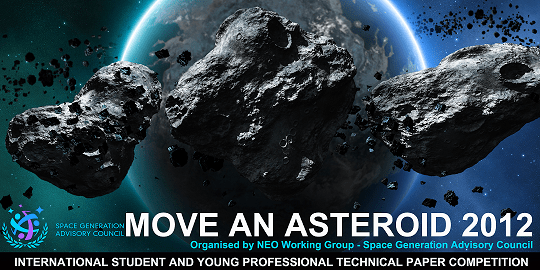 On October 26, Massachusetts Institute of Technology graduate student Sung Wook Paek won the United Nations Space Generation Advisory Council’s 2012 Move an Asteroid Technical Paper Competition with the suggestion that pellets full of white powder could be shot at near Earth objects. The pellets would impart a slight nudge, but the real trick would be coloring the object’s surface to better reflect solar radiation pressure. With a reflective surface in the right position, the asteroid could operate like a solar sail, using the Sun’s radiation to slowly shift its position. Paek estimated that in the example of the near Earth asteroid Apophis, such a solution would need 20 years and five tons of paint. Paek sees potential for applying other surface modifiers as well, such as drag-enhancing powder that would slow an asteroid’s atmospheric entry sufficiently to reduce the surviving mass. He suggests that to make such a solution realistic, the pellets would need to be produced in space, perhaps aboard the International Space Station.